I played the game with 4 experienced adult gamers (all good at maths) and it was interesting to see how everyone was trying to come up with the better combinations than other players. You may need to live in the UK to get this reference, but it’s basically a zombie version of the numbers round in Channel 4’s Countdown. The artwork is great and the zombies also come in two styles too which you can see in this image. I’ve actually been directly involved in this project a small amount recently, through a mutual friend, which has been a lot of fun. I’ve been helping add some extra game play depth and variety, plus I’ve been creating a set of advanced rules which can be added in different mixtures to add various effects that get triggered during the game (which add a lot more difficulty) and the need for some tactics. 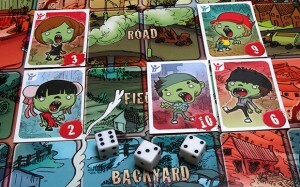 This entry was posted on Tuesday, October 22nd, 2013 at 11:16 pm	and is filed under Board Games, City of Zombies, On the Radar. You can follow any responses to this entry through the RSS 2.0 feed. You can leave a response, or trackback from your own site.